When were these last used in New York? The last time that I can clearly remember them was during the 1980's. The big roller curtain over the rear exit door was quite distinctive, and still stands out in my memory. That'd pretty much be it, likely the early to mid-1980's. 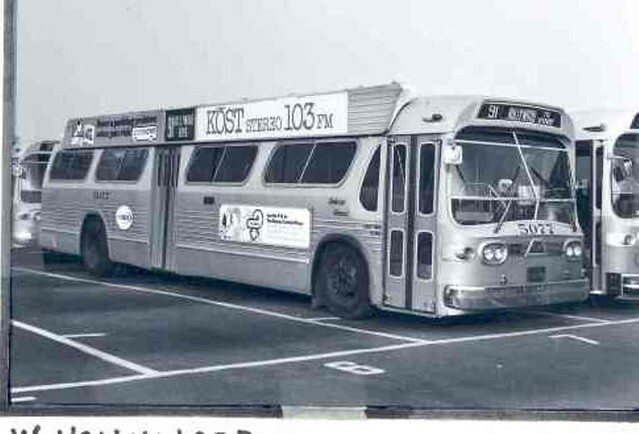 I've seen photos of the 8829-8878 buses from the 1968 order of T6H-5305A's to the TA which had the "batwings" initially, and they were removed by the time a few saw service in the early '80's on OA routes such as M101. Those signs, B.T.W., were ~34.5" wide. But as for that specific route, I'd reckon they largely only exist on non-batwing side signs made after 1969 or so. Many of them, cut up in little pieces, have been sold over the years on eBay. Several sections of an OA roll sign dated Dec. 13, 1966 have been offered for many years (except for 3 Limited Stops, 4 Fifth Ave Ft Washington, 12 Spring St Delancey St, 17 79 Street Crosstown and 21 Houston St Avenue C). The ones from the TA side being offered were usually from the Flatbush and Ulmer Park depots, but have yet to see any batwing side signs for the TA's Manhattan routes. Thanks for the detailed input as well as the photo of the center roller curtain; man, you could read those suckers a block away!!! I see my memory was about right; I cannot recall the "batwings" beyond the mid-80's; to me, it seemed as though one day they were quite commonplace, and, a few days later.....they were all gone. Some TNJ Fishbowls also had "batwings", back in the day.....man, where have the years gotten to? On 8733, I saw reference to '10 8th AVE CENTRAL PK W' on the side - a clear sign that was a 146th Street depot bus. And the side roll signs were last seen on TA and OA 'batwings' in the mid-1970's, after which the 'square' was plastered as much with advertising as the two 'long' ones. Again, very informative input and interesting trivia! I am now recalling that, in later years, the center roller sign area was covered over by ads; I remember that, in those days, a bus still displaying the large roller sign over the rear doors were becoming more and more difficult to spot. Too, I had long thought that the "batwings" were only used in the New York area; I was surprised to learn (in later years) that other properties used them as well, including Metro Dade County Transit Authority, and Nashville. I am not 100% positive, but I think they were also used in New Orleans. Those "batwings" really could make you "stand up and take notice", that's for sure! That 8712 bus' front roll sign was definitely from 1966 vintage; it would have said 'via 7 AVE' at the end originally before that was blacked out. But another major city that had 'batwings' - and the same type of side roll sign layout as New York - was Los Angeles. Pics of such buses are few and far between, but some have turned up from time to time on eBay. Also, another 'batwing' city, I.I.N.M., was New Orleans. I was not at all aware that Los Angeles once used "batwings"; I have, to date, never seen any pictures whatsoever showing any LA buses fitted with the wings. Type in "Los Angeles bus" on eBay, you'll see some L.A. batwing photos. Even on Flxibles, not just the GM Fishbowls. W.B., yes, New Orleans (NOBSI) used batwings on GM's and Flxibles as well. There were many other cities and counties that used batwings on their bus fleets. Here's a photo of TA 8059 with the center section used by what I think was a yellow smiley with a blue background with a message, " Courtesy Powers The MTA." Photographer unknown; collection of Joe Testagrose. 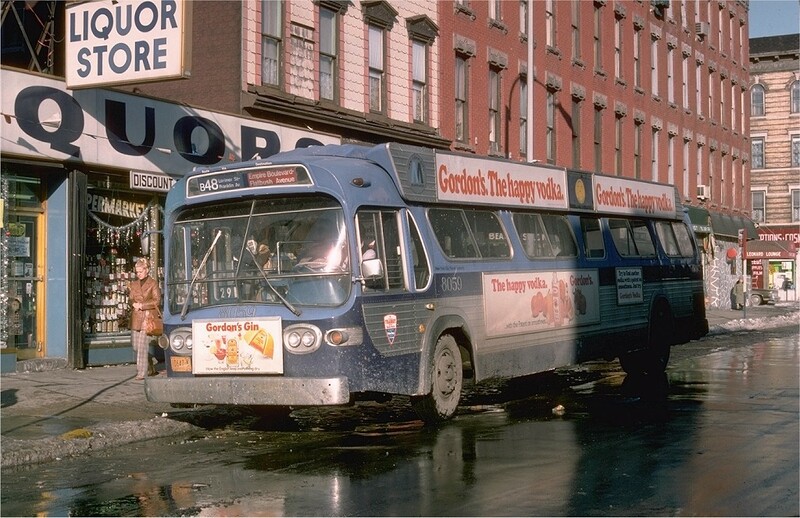 Taken at Manhattan & Nassau Avenues on January 20, 1977.